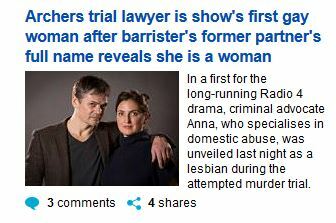 If only there was another less old-fashioned word for 'gay woman', perhaps beginning with L.
Oh, Lynda's clearly les, btw. PS Helen's guilty as hell and should be put away for life. If only people would talk to each in Ambridge this could have been cleared up months ago... I cant actauly remember all the plot lines now..except that the doctor has met Rob before but can't remember where..is that still significant ? ?..